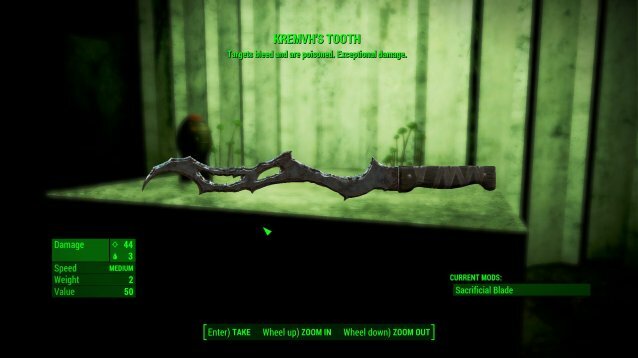 Fallout 4 has lots of great weapons and side lore, but few are better IMHO than Kremvh’s Tooth! The lore and backstory are even darker than some of the other creepy and corrupt side lore of the world before the war, but I don’t want to ruin the experience for you. This weapon is seriously wicked, with not just the most DPS and speed, but also applies a bleed effect AND poison! You’re going to need to be around level 15 or so because there is no easy way to get this blade of death and mayhem, you’re going to have to fight for it. The fight can be tough, so stock up on stims…and rad-x and rad away, because you’re going to have to take a long swim in some very nasty radiated water. But the fighting, sickness and nightmares will be worth it when you start cutting down swaths of ghouls with every swing!